Northern Hydraulics offers the finest in industrial pressure washers from some of the finest names in the industry. Hot and cold water models available by Epps, Delco, and Simpson. Are you looking for a quality unit for use around the farm, ranch or construction site? Maybe a stationary unit to be used in a food service or production facility? 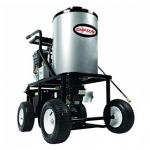 All of the industrial and commercial pressure washers offered here will stand the test of time. Call us today at 1-800-823-4937 to find the right heavy duty pressure washer to fit your needs.